I’m standing in the Barnes and Noble at The Gateway, staring at the various selections of the Criterion Collection DVDs, when it sinks in that in about 15 minutes I’m headed to The Depot to see a longtime favorite of mine, Scott Hansen, aka Tycho. I climb up to the second floor of The Depot to the stage area, passing others on their way down to go have a smoke, grab their friends, steal a drink from a flask or whatever. Making my way into the dark room, I slink into the nearest corner, burrowing deep in the shadows±for now anyway—to have a look around. My eyes wander to the sides of the room, which are lined with people in chairs. My gaze is pulled to the stage, upon which sits a DJ booth surrounded by various other pieces of musical equipment—drums, guitars, keyboards, etc., all covered in a veil of dim light-blue stage lighting. A small crowd of younger hipsters and teenyboppers had formed in front of the stage, and they milled about, conversing and laughing. Towards the back of the room, an older crowd had taken over the chairs and tables scattered around. I thought it strange to see people in, what I was guessing, their 40s and 50s at a show like this, but soon I realized that there is no age limit for excellent music. Tycho’s opener, Christopher Willits, took to the stage. A few days prior to the show I checked out a few of Willits’ tunes on YouTube and found out that he plays a very, very ambient brand of electro-acoustic music, something I wasn’t too keen on at the time, but was willing to give a chance—now in what was a more cozy setting. Willits addressed the crowd, which had gained a few more members, and thanked them for coming out to the second night of what was going to be a very long tour. “It’s so good to initiate with you,” he told us all as he began his set. As the lights dimmed, a humming began to fill The Depot, very quietly at first until it built into a piercing tone accompanied by a very slow sunrise on the projection screen behind the stage. I didn’t think it was going to end as it went on for about six or seven minutes, until a subtle bass drop broke through the humming and the screen was awash with images of passing blue skies and clouds before quickly fading into soft, ambient beats and noises. This was much of how Willits’ set went down—building crescendos broken by sudden drops in the music, only to fade into unintelligible voice and guitar loops. As I said before, this type of music isn’t really my bag, and soon my mind was adrift with what was happening in the venue. 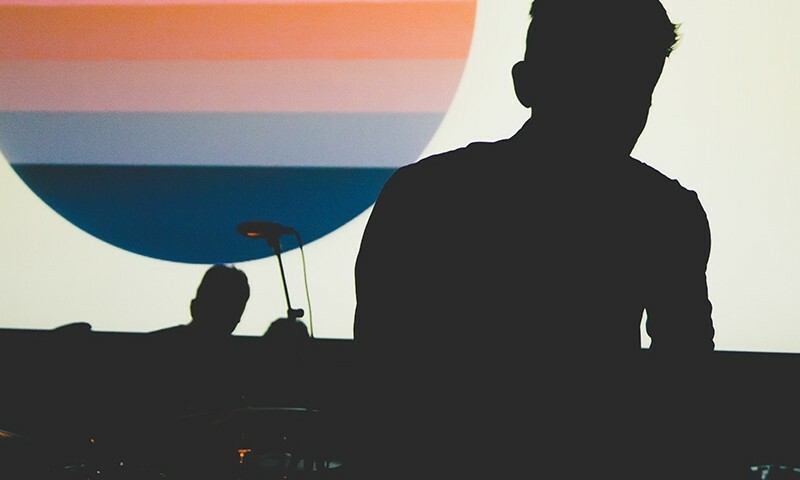 Many of the patrons chattered among each other, at times louder than Willits’ music, and my thoughts were overrun with ideas of homemade quesadillas when a rising moon on the projection screen finished out his set and the crowd began its mad dash between acts. I killed the time by doodling next to the notes I had been taking, and as the time for Tycho’s set grew closer, I noticed that more and more people were flowing past me to find prime spots on the dance floor. The venue was full again, with more people packing themselves wherever they could find a spot to clearly see the stage. Moments later, the man himself, Scott Hansen, took to the stage with his band, much to the pleasure of the audience—they let out whoops and hollers in excitement. I didn’t realize that Hansen would be playing with a live band, which made me even more ready for his set to begin. The stage background became vivid red, with the shadows of Hansen and his three bandmates dancing across it, creating long, distorted silhouettes. Each player found their place and without warning began playing the title track, Awake, from his newest album. Hansen’s music is the perfect blend of upbeat and ambient, and within seconds, he had the crowd bobbing their heads in sync with his music. There was no chatter among the crowd anymore, even near the back—everyone’s eyes were transfixed on the spectacle in front of them. The large screen displayed strange, layered images of beautiful women and a sweeping bird’s eye view of rich, green landscapes. Hearing the music played live is a very different experience than hearing it in headphones or on vinyl—it has a much more intimate feel. I felt a small smile form across my lips, not only because I was so stoked to finally see Tycho perform live, but also because his music makes me genuinely happy. 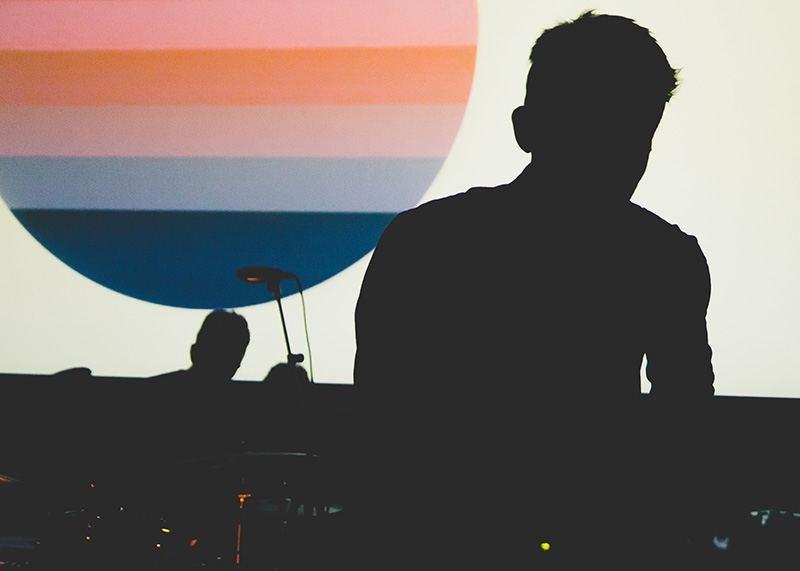 I began moving around the venue to see the effect of Tycho’s live set on other people. An older couple to the right of the stage were dancing, both of them moving terribly off-beat to the music but soaking up every bit of it. He spun her into a dip and then they both continued their awkward moves and I moved on. Clouds of marijuana smoke rose from the middle of the swaying crowd, and the sickly sweet smell made my mouth water as I made my way to the other side of the stage. Hansen was using all of the cards in his deck, digging up tracks from his albums Dive and Past Is Prologue, to get the crowd really into it. He moved between two music machines and sometimes even played both at the same time. At one point his band completely left the stage, leaving it up to him to entertain us with live remixes of his songs. Soon, his band was back (after making a slick return, mid-remix, to help Hansen finish out a track) and grooving right along with him again. Too soon they left the stage bathed in the same dim light-blue as before, thanking everyone for making it out to the show and exiting to their right. The crowd bellowed for an encore, desperately clinging to the last notes still ringing out in the venue. Someone shouted “THEY’RE REALLY FINISHED, OKAY? !”—a statement that everyone made a point to ignore as they continued to plead for more. The blue light wasn’t fading out or being washed away by the normal soft light of the venue, so it gave me hope that the band would come out once more. And they did—reigniting the fire behind that small smile I had before. Hansen thanked everyone again for coming out and told us that they would be playing two more songs, which received quite the ovation from the hungry mob before him. As they finished the last song—a dance-y beat that I didn’t quite recognize had everyone moving more than any before it had—Hansen once again thanked us all as the venue lights kicked on and I dashed towards the exit to beat the crowd, so that I could make it home in time for a quesadilla.